Excluding work in the electrical and plumbing fields as defined by § 563-126 of this chapter, any repair, remodeling, alteration, conversion, modernization, home raising or home elevating services, improvement or addition to residential property, and includes but is not limited to painting of residential structures; carpentry; fencing; driveways; exterminating; flooring; ductwork for heating, ventilation and air-conditioning systems; masonry; roofing; siding; the construction, installation and/or servicing of swimming pools and portable and permanent spas; and waterproofing; as well as other improvements to structures or upon land which are part of residential property, including landscaping and arboriculture, which as used herein shall mean tree sprayers, tree pruners, tree stump removers and all other tree services; but shall not include the construction of a new home or work done by a contractor in compliance with a guaranty of completion on new residential property or the sale of goods by a seller who neither arranges to perform nor performs, directly or indirectly, any work or labor in connection with the installation of or application of the goods or improvements to residences owned by or controlled by any government subdivision. So if you are performing home improvement work in Suffolk County then you need a license and if you obtain a license from Suffolk County Consumer Affairs you are subject to their jurisdiction. That mean that Consumer Affairs issues your license, can suspend your license, can issue violations to you for failure to follow the rules and regulations governing home improvement contractors and can revoke your license. What is a Notice of Violation from Consumer Affairs? Many, if not most, Office of Consumer Affairs violations start with a complaint from a consumer (usually a home owner) regarding a contractor’s performance on the project. Once the complaint is lodged with Consumer Affairs they will assign an investigator to look into the allegations and determine whether there was any wrong doing that would subject the licensee to a penalty. The first step in the process is that the investigator will typically forward the complaint to the license holder and give them a chance to respond in writing. It is at this point that the home improvement contractor should strongly consider engaging legal counsel as it is the first step in defending yourself and protecting your rights. If you received a letter from the District Attorney asking you about potential crimes you may have committed you wouldn’t just respond to them without a lawyer. 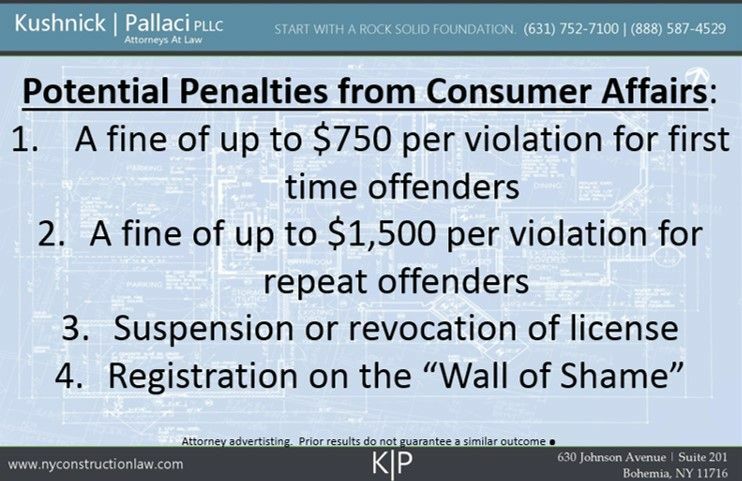 While not necessarily criminal, Consumer Affairs can devastate your livelihood by revoking your license, fining you and even requiring that you register for the “Wall of Shame” (seriously, its a thing). After the written response is sent to Consumer Affairs they may next perform a site visit (though not always) and review your contract. After that you will receive a Notice of Violation (or several) if the investigator found any wrong doing. If you didn’t engage legal counsel after receiving the initial complaint then you should certainly do so now. The Notice of Violation will describe the violation that the home improvement contractor is accused of and cite to the statue or regulation that was allegedly violated. It will also schedule a hearing for you to determine the validity of the violation. What types of things can a Notice of Violation cover? There are any number of issues that could constitute a violation. It is the Office of Consumer Affairs’ burden to establish that the violation occurred but licensees are entitled to have an attorney represent them in the proceeding and offer a defense or try to reduce the violation. The above violations can be found even where the work performed was correct (and beautiful). 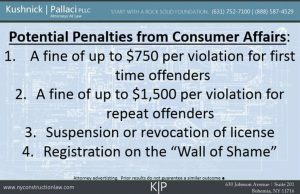 What type of penalties exist for a Consumer Affairs Notice of Violation? If the home improvement contractor is not able to resolve the Notice of Violation before a hearing then the hearing will proceed. A Consumer Affairs hearing is kind of like a mini-trial to determine whether the violation is valid or should be dismissed. If the violation is upheld, then the Administrative Law Judge overseeing the hearing can impose a penalty. For first time offenders, a penalty of up to $750 per violation can be imposed. For subsequent violations a penalty of up to $1,500 per violation can be imposed. In extreme situations the home improvement contractor’s license can be revoked and/or he or she can be required to register for the Wall of Shame. Click here to contact one of our attorneys about defending a Notice of Violation you received. This entry was posted in Home Improvement Contract and tagged Consumer Affairs, Home Improvement Contractor, Violations by VTP. Bookmark the permalink.